"Crispy sugar cookies. Not too sweet or too plain. Great for holidays or other special occasions or just for any time." Mix confectioners' sugar, butter or margarine, egg, vanilla and almond extract. Stir in flour, baking soda and cream of tartar. Roll into big ball and wrap in plastic wrap and let chill for at least 3 hours. Divide dough into halves. Roll each half 3/16 inch thick on lightly floured board. Cut desired shapes with 2 to 2 1/2 inch cookie cutters. Sprinkle with granulated sugar. Place on lightly greased cookie sheets. Bake until edges are a light brown, 6 - 8 minutes. just didn't work well for me. Delicious, especially good with a butter icing! Crispy, tasty and not too greasy! 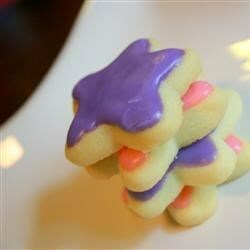 One of the best sugar cookies ever! !